If you ask around about the Moirs, you’ll probably always hear the same thing: ‘Oh, they’re that skating family, right?’. For us Moirs, skating has always been a way of life. Scott is an Olympic and World Champion figure skater, and his mom and aunt are skating coaches in the local area. But while we’ve been working on our Twizzles and Choctaws, Uncle Paul has been working on something else altogether - perfecting the art of skate sharpening. In fact, what started as sharpening and fixing the blades for local skating teams now has people travelling from all over Ontario for Paul’s skate sharpening expertise. So, when Scott and Paul had the idea to combine Scott’s knowledge of skating with Paul’s craftsmanship and skill – Moir’s Skate Shop was born. Why not stop by, say hello and talk shop while we sharpen your skates? Whether you’re playing hockey or figure skating, a well-sharpened skate can make a huge difference. But, although it might sound simple, sharpening a skate is anything but. After you’ve considered things like the radius of hollow and the centre of the skate, getting the perfectly sharp blade still requires a great deal of care, attention to detail and experience. Luckily, Paul has over 30 years’ experience sharpening skates. He’s gone from sharpening his daughter's skates to the skates of his wife’s skaters and all her synchronized skating teams to sharpening the skates of multiple World Champions and two very special Olympic Champions, all because of his skill, dedication to the craft and attention to detail. Whether you’re looking for your very first pair of skates, the pair of skates to take your skating to the next level or simply a new set of blades, we’re here to help. We know that finding the right boot with the right fit can make a huge difference to your safety, your enthusiasm and your performance on the ice - that’s why Scott is on hand to answer any questions you might have and to help you find that perfect pair of skates. As a World and Olympic champion, there’s not much Scott doesn’t know about skates – he’s tried all the brands, he knows what all the professional skaters prefer and – importantly – he knows what works. So, whether you’re a beginner, pro or somewhere in-between, when you drop in to Moir’s, you’ll have access to Olympian advice to help take your skating to the next level. At Moir’s, skating is in our blood. We know what makes a decent skate and the importance of carefully considered and delicately sharpened blades. But we also know that skating is about much more than just the time you spend out on the ice. It’s about catching up with fellow skaters while your skates are in the shop being sharpened. It’s about trading advice, stories and experience. It’s about the community. And that’s what we want Moir’s to be. Yes, we want to provide you with the best skate sharpening you’ve ever had. And yes, we want you to come to chat with Scott about your next pair of skates. But we also want you to just pop by for a chat and to hang out. Our vision for Moir’s is more than just a shop – it’s a place for the skaters and coaches alike to hang out, catch-up and continue building the community that we’ve been so proud to be a part of for the past 30 years. Scott comes from a skating family, skating is in his blood. His mother is a figure skating coach and both of his older brothers played hockey as well as figure skated. As a young boy Scott began figure skating to improve his skating skills to help with his hockey however it was soon after Scott began skating with his partner, Tessa Virtue in 1997 that his path took a turn and he began to pursue competitive ice dancing. The partnership that started when she was seven and he was nine still goes strong today after over 20 years of skating together. This past February, Scott and Tessa capped off their two year "comeback" by winning two Olympic gold medals in Pyeongchang. Figure skating has given Scott many opportunities and life experiences and he looks forward to hearing all about your skating experiences when you stop in to talk “shop” with him at Moir’s. Paul has over 30 years of skate sharpening experience. With being married to a figure skating coach and having three daughters who are still actively involved in the sport, Paul began sharpening skates as there was no one in the area to sharpen his daughters’s skates. However, it was not long before skate sharpening quickly became a passion for Paul. 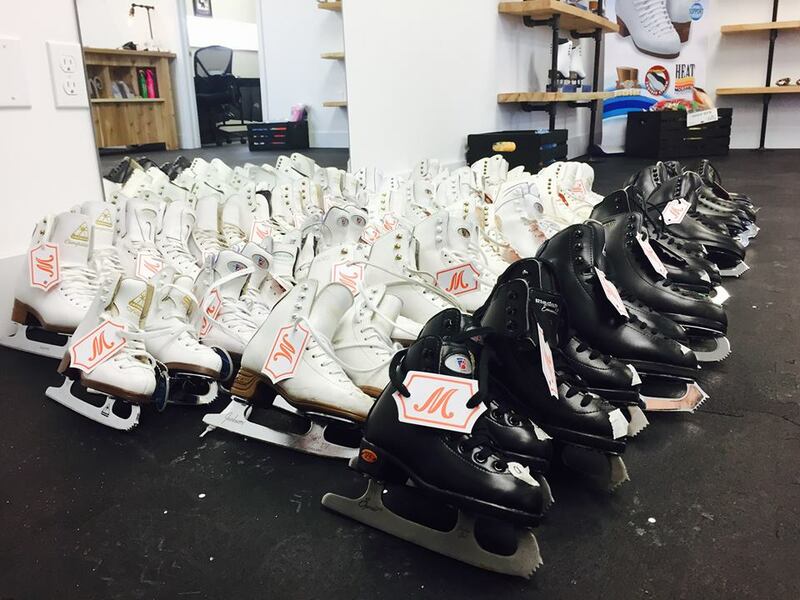 After 30 years of sharpening, Paul offers one-of-a-kind skating equipment expertise and world class skate sharpening on every level from learn to skate, recreational skaters, and competitive hockey players to World & Olympic Champion figure skaters. Paul is thrilled to be able to play his part and help skaters all over southwestern Ontario achieve their skating goals. Drop in and visit us! Please note: We will be CLOSED Saturday, April 6th as Paul is volunteering at a local skating club's year-end ice show. We apologize for any inconvenience. Regular business hours will resume Tuesday, April 23rd.